Thanksgiving: What I’m Thankful I Don’t Have. | Kimberlee K.
Thanksgiving: What I’m Thankful I Don’t Have. So in case you haven’t heard, Thanksgiving is tomorrow. TOMORROW. Yes folks, the time has finally come to swim in the buttery mashed potato waterfalls. To pile one half of your plate solely with rolls, just because you can. To look at the desserts and tell yourself no, and then grab a fork for each hand. I personally have been dreaming about Thanksgiving dinner since a humid evening this past July and I’ve smelled turkey in exactly 5 places since then. Strange, understandable, yet worrisome, I know. Throughout the 4 month stretch of award worthy patience, I thought about all that I am thankful for. Family, friends, faith, health, the men that make up the LA Kings hockey team. And amongst my gratefulness for what I have, I also came across a number of things I’m thankful I don’t have. Both myself in particular and our world as a whole. 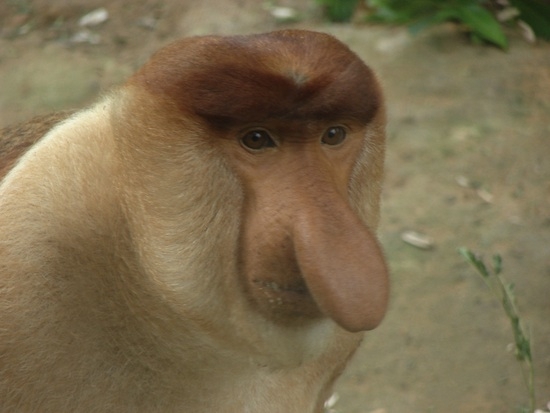 2) The nose of a Proboscis Monkey. 4) A car that only drives backwards. They’d call me carsick Kim with the crooked neck. Talk about a complex. 5) Hover cars. Sure, the technology would be incredible. But are we really ready for the old “I cut you off because a pigeon was chasing me” excuse? 6) Rain water made of Windex. I’ve washed windows and mirrors for many the holiday occasion, and have shot Windex in my eye roughly 85% of the time. This would be a nightmare. Great for glass houses, though. 7) A burrito phobia. Life would be such a cold, dark, BRC-less place. I can’t even think of such pain. 10) Hands that are just rocks. Aside from destroying most everything I touch, I wouldn’t really get a lot done, except maybe annihilate “scissor” dealing people in Rock Paper Scissors. It’s too obvious they’d think. She won’t use rock. But I would. Every time. Amateurs.